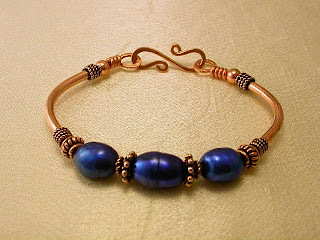 Three big Royal blue baroque freshwater pearls are the splash of color in this noodle bracelet. Copper noodles and accents really go well with the deep beautiful blue on these big, I mean big dyed pearls.. the center pearl is 15mm by 9mm the side pearls are around 11mm.. One of the problems that pearls pose is they are tough but fragile at the same time, pearl necklaces have knots between each one to cushion and keep them from abrading and wearing away the nacre layers,, which is damage to the pearl and over time be unattractive, so when I use pearls strung on large wire as this I use very tiny gaskets between the pearl and the metal bead caps/spacer beads... this not only cushions the pearl but helps reduce the turning of the pearl on the wire which helps retain not only the beauty but decreases damage to the pearls.. This one fits 7" and under... A great look with jeans and casual!